The daily tides wearing at the cliffs below Del Playa succeeded in felling one of Isla Vista’s exposed concrete caissons on Tuesday. These are drilled dozens of feet belowground to provide a firmer footing for the structure on top, and more and more of them have become visible at Isla Vista’s cliff face. When a building comes within a 15-foot danger zone mandated by the county, the owner is warned that measures must be taken. Some property owners have had to chop off the rear portion of their apartment buildings due to the ongoing cliff erosion, said Carl Lindberg, a county building inspector. During the winter two years ago, 28 people had to be re-housed on an emergency basis when erosion undermined part of their house, recalled Spencer Brandt, president of Isla Vista’s governing Community Service District. Lindberg said caissons are tied into the building they underlay, but at least one has obviously let loose. He noted that the geology of the cliffs — the erosion rates vary depending on the soil and rock present — and relative locations of homes farther inland exposed some to danger more than others. James Gelb, who sold 37 of his Del Playa properties in Isla Vista in 2017, raised a warning in an email to media sources that he believed students were at risk from such events. It was 6653 Del Playa that lost its deck to the sea in January 2017, which Gelb owned at the time. The Service District has been in talks with the county, said Brandt, which has been discussing the erosion at the bluffs with property owners. Five feet between home and bluff is the current criteria for red-tagging a building as an unsafe structure; at 10 feet, a Notice of Violation is issued, and at 15 feet, the property is placed on a watch list. This has been the county’s standard since the late 1990s, said Massoud Abolhoda, the county’s building official, when the assumption was a smaller maximum loss of land to wave action. Fifteen or 16 feet of bluff fell during the 2017 incident, he said, which prompted the current conversation between the county and property owners on changing the rules. The new criteria may be 15, 20, and 25 feet for requirement to act, violation, and concern, but the distances have not been finalized, he emphasized. 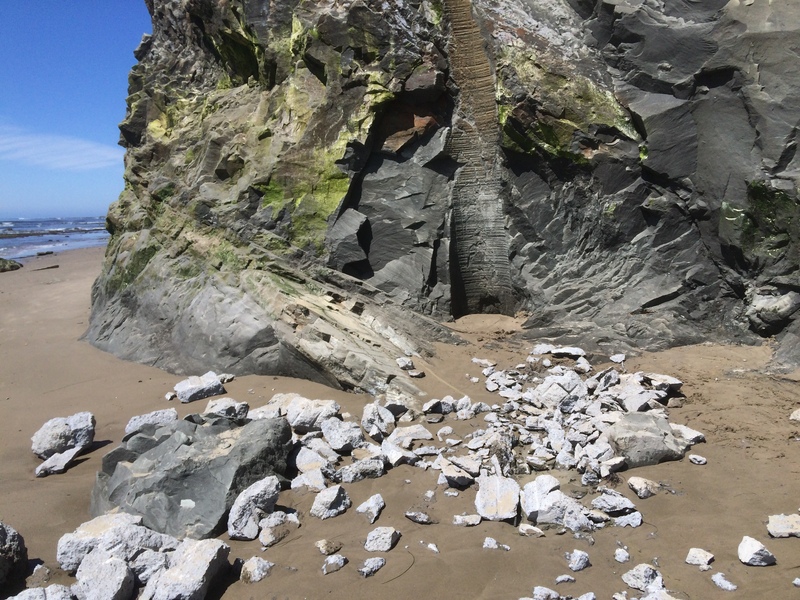 Photo: Google Maps 2019Wave action below Isla Vista’s cliffs is carving deep coves, exposing caissons supporting buildings, and occasionally causing a pillar to fall, including on Tuesday. No one was injured on Tuesday, and a contractor crew will break up the caisson in-between high tides. Heavy equipment is not allowed on the beach, said Lindberg, so it could be a few days to a week before they finish. This story was corrected on April 15, 2019: James Gelb sold 37, not 80, Del Playa properties in 2017.